BURGHAUSEN, GERMANY, October 23, 2018 /EINPresswire.com/ — Medias Klinikum GmbH & Co KG, a private hospital specialized in surgical oncology, focusing on the treatment of primary and metastatic solid tumors, announces that the results from an ongoing phase II study of regional chemotherapy in terms of hypoxic isolated abdominal perfusion with chemofiltration (HAP-F) for chemoresistant and recurrent ovarian cancer, have been presented at the 38th Congress of the European Society of Surgical Oncology (ESSO) and BASO – the Association for Cancer Surgery. The study, Isolated hypoxic abdominal perfusion breaks through chemoresistance in recurrent FIGO stage IIIC and IV ovarian cancer: experience in 143 platinum-refractory and 25 chemonaive ovarian cancer patients, was conducted by Professor Dr. Karl R. Aigner, one of the world’s most experienced experts in the field of regional chemotherapy, and his group. In 1981, he developed the technique of isolated liver perfusion and was the first physician worldwide performing this method in humans using a heart-lung machine. An abstract of the presented data is published under the abstract number ESSO38-0273 in the abstract book of the Journal of the European Society of Surgical Oncology (EJSO). Commenting on the announcement, Professor Dr. Karl R. Aigner, Head of the Department of Surgical Oncology at Medias Klinikum, said, “Increased dose or dose-dense chemotherapy for platinum-refractory ovarian cancer is limited because of increasing toxicity. 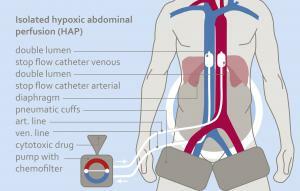 In order to break through drug resistance and reduce toxicity, augmented drug exposure was administered only to the abdomen by means of an isolated perfusion system with extracorporeal circuit. Toxicity and side-effects were generally low due to subsequent chemofiltration”. The preliminary results of the study presented at the 38th Congress of the European Society of Surgical Oncology (ESSO) this year, showed that HAP-F for patients with chemoresistant and recurrent FIGO stage IIIC and IV ovarian cancer, is an effective treatment modality that breaks through drug resistance, with encouraging survival data and considerable, but not only, for patients who have no other treatment options due to chemoresistance.